Left: All the water in the world (1.4087 billion cubic kilometres of it) including sea water, ice, lakes, rivers, ground water, clouds, etc. 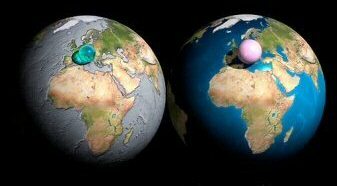 Right: All the air in the atmosphere (5140 trillion tonnes of it) gathered into a ball at sea-level density. Shown on the same scale as the Earth. Book list - just a list of books for friends (other must read book lists. eat local challenge - can I/we eat local-only food for one day a week?